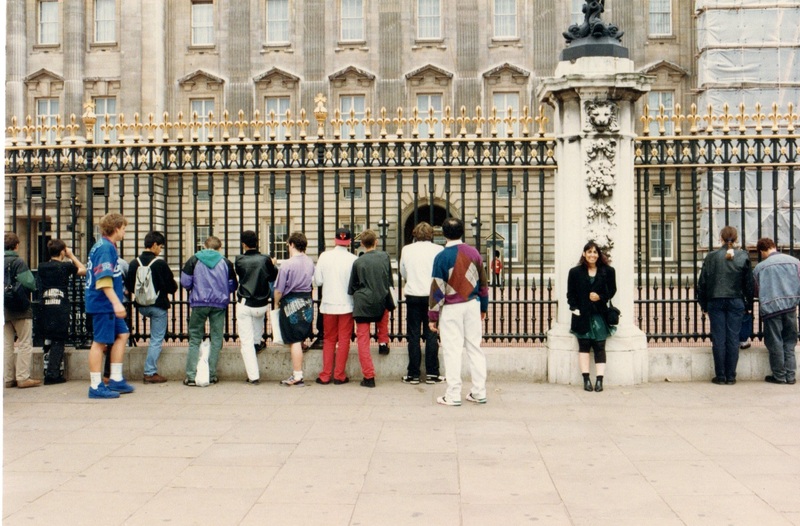 Dec. 1991: Upon landing at Heathrow, we took the Tube so I could get my first glimpse of Buckingham Palace before going on to Wales. I rarely went anywhere in my 20s and early 30s. I was too focused then on trying to stay employed in the entertainment industry… and looking for love in all the wrong places. And then: I finally found it, with someone who was here on a student visa. And a few years later, I found myself on a plane to London so I could meet his family. It was Christmas, and as a lifelong Californian, I expected to be cold. That frightened me. “I’m kind of a hothouse flower,” I reminded him. But you know what? Weather conditions that would keep me indoors here in Los Angeles didn’t phase me in the United Kingdom. OK, there was that one outing on the top of Caerphilly Mountain that brought tears to my eyes that I swore at the time were frozen — but I discovered that I could handle freezing temperatures, rainy weather and cold, blustery wind just fine… so long as I was experiencing them anywhere but California. 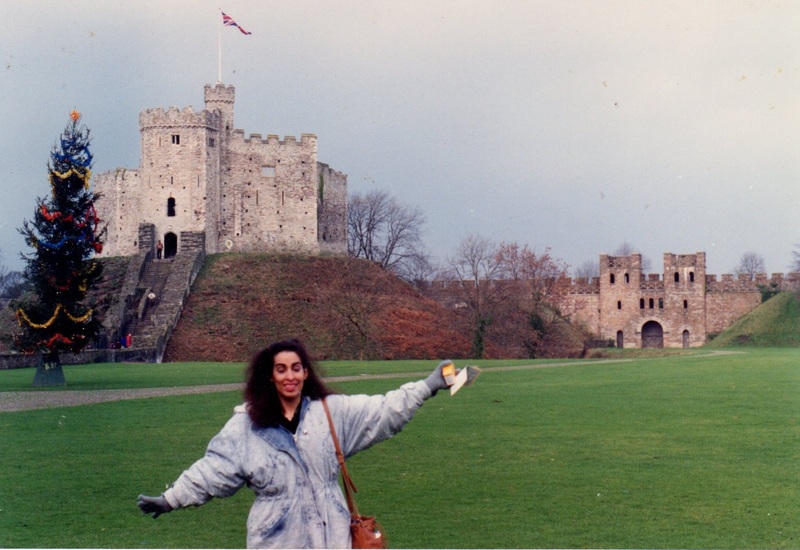 Dec. 1991: The Norman Keep and me. At Cardiff Castle. That my American accent was just as incomprehensible to my future in-laws as theirs was to me. That I love to travel. I love seeing new places, trying new foods, learning new histories, taking photographs (prior to that trip, I did not even own a camera). And as the years have passed and we married and became a family, this love is something we shared with our daughter. She made her first trip to meet her British grandparents when she was just four months old and we visited as often as our budget would allow — until the economy crashed. By then, my father-in-law had passed away. We could have saved a lot of money by staying home, but I’m proud that our girl has a relationship with her cousins and wonderful memories of her grandpa. She has also been to big cities like New York and Paris and natural wonders like Yosemite and Alaska’s Glacier Park. And I know she won’t wait until her mid-thirties to get out of her comfort zone and see the world outside Los Angeles. Because we are a family of travelers. I loved traveling in Britian! It’s so wonderful to marry into a another culture and for your children to have that experience. Now I’m craving lemon curd, clotted cream and scones. Oh, what a lucky gal are you. My gal pals and I have such fondness for British actors, and films set in the UK. And you married a man from “across the Pond.” How cool is that?! Thanks for telling about your first trip to England. Hug the foggy streets of London for me the next time you go. It is wonderful to travel as a family – whether you are able to go overseas or exploring your homeland. So many shared memories, so many little lessons learned. What a wonderful story of meeting your future in-laws. Hopefully when my turn comes to visit the UK, I will be hardier than I am in SoCal. Love the castle pics, and that your daughter has a bond with her British cousins. Hey Donna! So glad you’ve joined us. Generation Fabulous is so lucky to have you as a member! I loved London. I didn’t expect I would as much as I did. We even rented a car and drove from Heathrow to Bath for four days and had the most amazing time. I did think I was going to die most of the time my husband was driving, but I didn’t. The countryside is so gorgeous. It is amazing that people could have lived there for so long and yet it seems so rural and pastoral. Loved seeing the hound-hunting crossing signs (even though i’m not the biggest hunting fan) and the rock walls that I think are probably very , very old. And the people of Great Britain are among the friendliest and most helpful to tourists anywhere. Once we were lost in Paris and the only people who stopped to help us were British. No big surprise there! Anyway, great post. Thanks for joining the blog hop.